Avra Elliott asked me a few questions for her article on wedding photography in the 2018 Perfect Southwest Weddings magazine from the Las Cruces Bulletin. You can read the article on page 20 of the guide. I thought it might be helpful to post my full answers to her questions. I always like being asked about wedding photography. It's a topic I can talk on and on about. 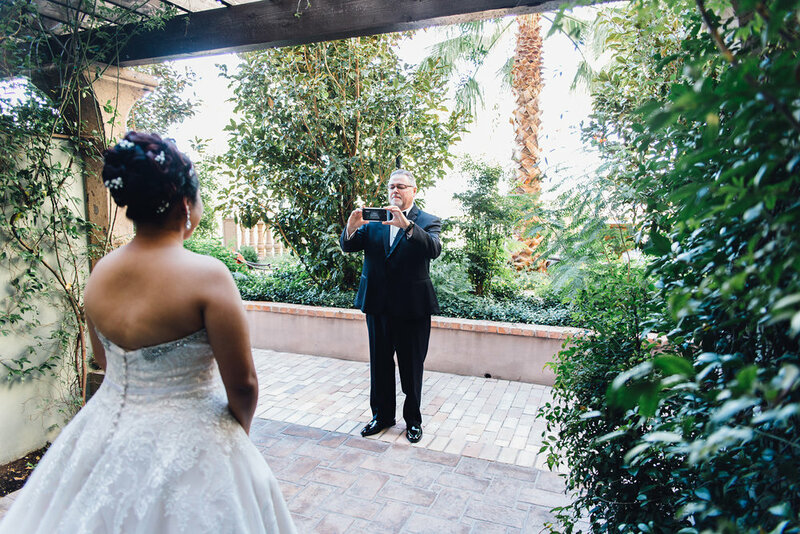 Have you noticed any new trends in how couples are choosing to record and preserve memories of their wedding day or the events leading up to it? Showing off the proposal is super popular right now and more and more couples are choosing to photograph their proposals. There are even websites (like HowHeAsked.com) and Instagram accounts who exclusively feature proposal moments. This means whoever is popping the question has a little more planning to do to make sure the moment is “picture perfect”. Another trend gaining popularity among brides is a “First Look” with their father. The “First Look” between bride and groom has been a popular option for several years but many brides still want the electrifying experience of their groom seeing them for the first time as they walk down the aisle. The daddy daughter spin-off of the First Look gives brides that special “Wow!” moment with the man who “loved her first”. As a photographer, I love this idea, because I can capture emotionally rich and even tear filled moments of the bride and her father. More than ever, brides and grooms are looking for photo products that don’t make them feel bad about their production. The “Guilt Free” movement focuses on supporting fair labor practices in your purchasing decisions. Brides and grooms are looking for locally made items, like frames and albums made in the USA instead of countries with unknown labor standards. Do you have any tips for couples on how to choose a photographer and the correct package for their wedding? First, make sure you love their photos and second, make sure they know how to photograph a wedding. Creating a handful of beautiful photos at a wedding is easy when you take a 1000 photos, but it takes experience to create hundreds of beautiful photos on a wedding day. You can’t redo your wedding photos. Look for packages that include plenty of coverage time on your wedding day. From getting ready photos to a sparkler send off from the reception, you will want your photographer there for all the important events. What is your personal goal or favorite moments when photographing a wedding? When I photograph a wedding my goal is to create artistic and authentic photos that will help the couple remember the biggest moments and the smallest details of their wedding. Weddings are full of emotional moments and each wedding has its own personality and dynamic so it is hard to pick a favorite one size fits all moment. But if I had to, I would say my favorite moment is when the bride and groom walk down the aisle as husband and wife. The expressions and smiles on the bride and groom’s faces are so genuine and unguardedly joyful that this shot always makes my top 10 from any wedding. Guess what? Matt and Lorena are on the cover of the 2018 Perfect Southwest Weddings magazine from the Las Cruces Bulletin! Throughout the wedding guide our wedding photography is featured alongside articles full of wedding planning advice and ideas. I thought it would be fun to post the photos that are published in the magazine with some behind the scenes details. Madeleine and Colt were married in scenic Ruidoso. They are both from Texas and planned a destination wedding that included their families and closest friends. Their wedding was simple and intimate with touches of elegance like the fur stole Madeleine wore for keep warm. After the church ceremony they held a wedding dinner and reception in a large vacation rental home. Family photos, white rose petals, and string lights were easy and stress free reception decor. Celina loves the fall season so we made sure to schedule her engagement portrait session when the pecan tree leaves were changing colors. 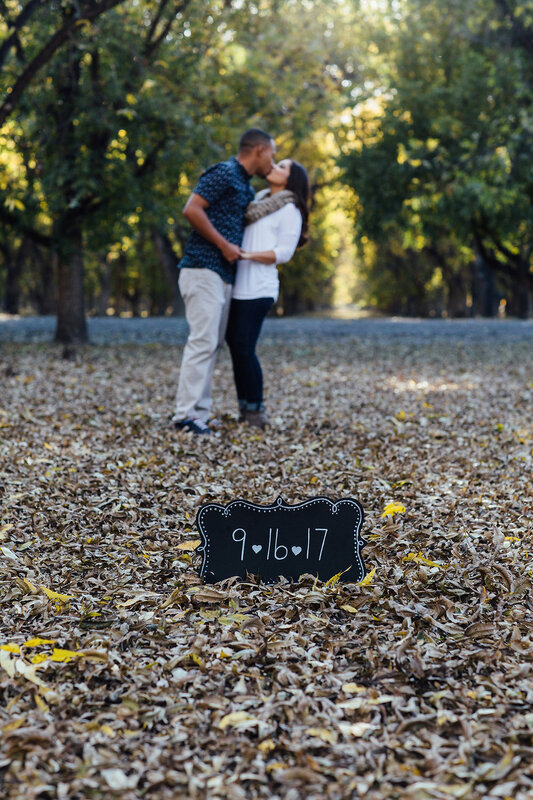 She included a chalkboard sign with her and Jammal’s wedding date and then used her engagement photos in their Save the Date cards. Celina’s wedding dress is from David’s Bridal. As a sweet gift to her father, Celina had a heart patch embroidered with a special message which she then attached to her dad’s tie. As a mom of two daughters, these daddy daughter moments at weddings always get me. 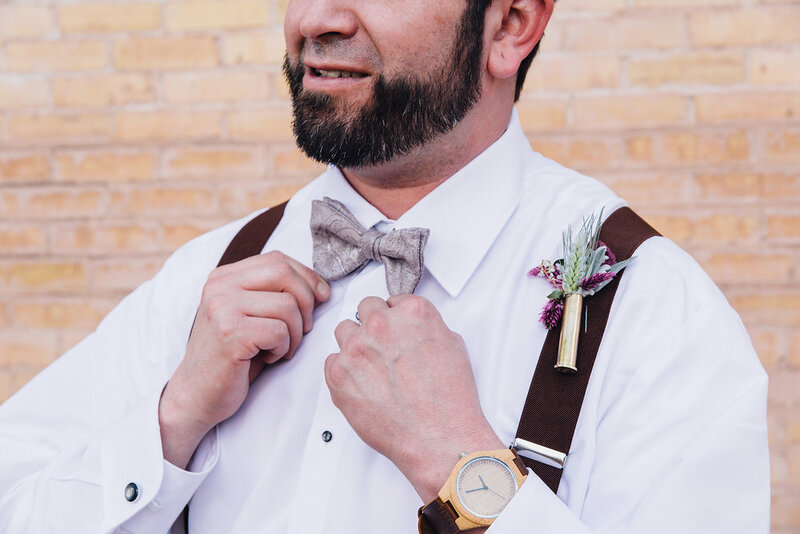 Jammal and Celina were married in the courtyard patio of the New Mexico Farm and Ranch Heritage Museum by Pastor Conrad from Living Waters church. It was a perfect sunny afternoon with a gorgeous view of the Organ Mountains. I think Celina was ahead of this year’s Pantone color trend. She used shades of purple in her bouquet which was created by Fiesta Flowers. Wedding day coordination and planning was assisted by Elegant Events. 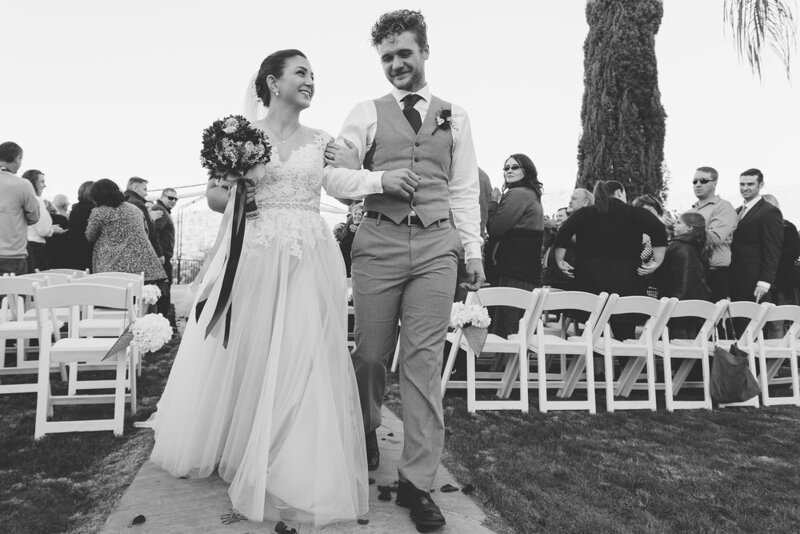 Benny and Melanie were married at Sonoma Ranch Golf Course on a warm summer day in August. I love summer skies. For me, nothing beats a bright blue sky with puffy white clouds. The covered patio at the clubhouse made the perfect dance floor for the rest of the evening. Lorena and Matt also used purple as one of their wedding colors. Since they were planning a wedding for October they used oranges and maroons as accent colors. Look at all those deep lovely colors in Lorena’s bouquet from Barb’s Flowerland. Stunning! Nate and I always highly suggest sunset photos to our clients. If you plan ahead it’s easy to sneak away from the wedding reception for a few moments. The garden patio area of the Hotel Encanto de Las Cruces looks incredible at night. If I didn’t know better I could be fooled into thinking we were miles away at an island resort. And look how well those sunset colors complement Lorena and Matt’s wedding colors?! 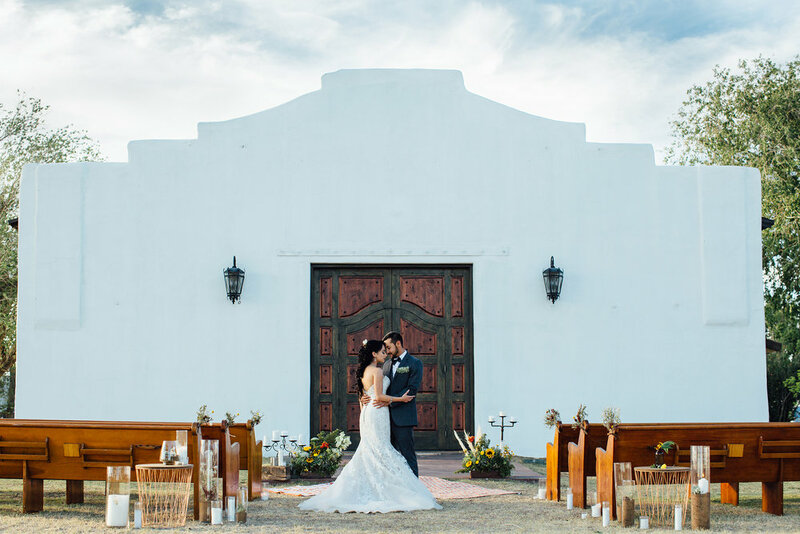 Garett and Gabrielle were married in one of the region’s most historic churches, the Basilica of San Albino on the Mesilla Plaza. Their getaway car was a vintage Porsche owned by Garett’s dad that was brought out of the garage for just this occasion. 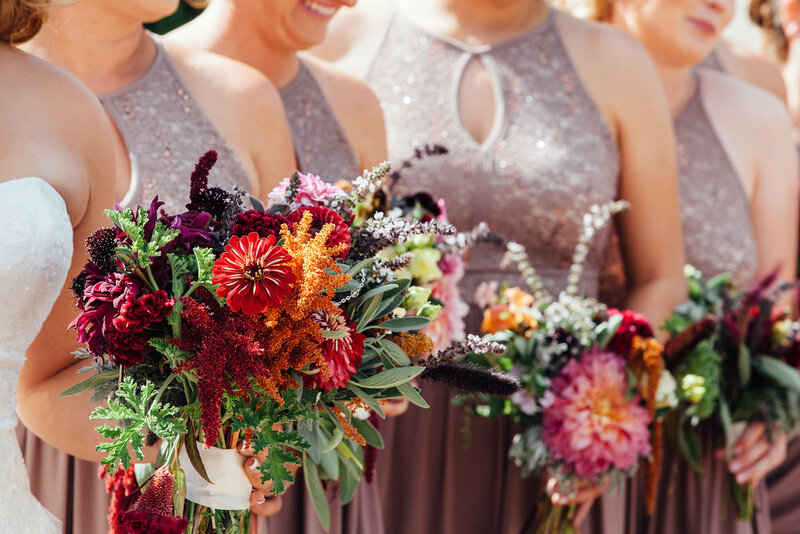 Jewel toned floral goodness and shotgun cased boutinerries was created by Calhoun Flower Farms. I have seen bridesmaids have matching hairstyles before but never groomsmen. The beards are a nice touch, well done gentlemen. Thankfully Garett and Gabrielle were up for more photos when sunset time rolled around. Big thanks to Garett’s brother and best man for holding my light and assisting me! Garett and Gabrielle held their reception at the Grapevine Plaza. Gabrielle and her bridesmaids had their hair and make up done by The Fixx Salon. Desiree had one of the most unique dresses I saw in 2017. Those flower details are so beautiful and she looked amazing on her wedding day! Before we wrapped up photography for the night, Nate convinced Desiree and Lucio to take one more photo. Nate loves photographing at night and he clearly had a vision in mind when he set up this photo. I think this photo of Desiree and Lucio, at the end of their wedding day, in the empty courtyard where they were married just a few hours prior will always carry a deep level of sentimentally with it. Dalina and Tony's summer wedding was very detail oriented. Which makes complete sense when you know Dalina. She's an auditor and is comfortable in the thick of details, details, details. And these details had a purpose and told a story. For instance, the pearls Dalina wore were from Tony's late mother. Tony's boutonniere was adorned with a small photo of his mother, which was a special way to have her close. Dalina's hair was done by Meghan Avilucea from Salon de Mesilla and her make up was done by Laura Juarez. After the church ceremony, their wedding reception was held at the picturesque Rio Grande Winery in Las Cruces, New Mexico. Everything at the reception was beautifully and romantically decorated by A Catered Affair. Dalina and Tony's cake was made by Deliciously Creative Cakes. A side note about the cake: During the cocktail hour of the reception Nate and I were photographing all the reception decor and details. Winds were starting to pick up and the sky was deepening to a grayish, thunder-storm-coming color. We hastened our step to get the detail photos we need as quickly as possible. As I was photographing the cake, the storm showed up in full force. You can actually see how the mountains are blocked out by the dust in the picture of the cake. The winds were so powerful that the whole cake started to move. AH! I grabbed onto the base to stable it and Dalina's uncle ran over and we both hauled that beautiful cake inside. Moments later the freak storm everyone talked about for the rest of the summer (known as a haboob, you learn something new everyday!) rolled through the reception. Luckily, Dalina and Tony were able to stay in good spirits as the venue and catering crew got to work putting things back together. Weddings in New Mexico, man, you never know what is going to happen! Luis and Sabrina live in Germany. Sabrina is originally from the area and when Luis proposed they both knew they wanted to plan a wedding in the desert. Determined to do things their way and with no stress involved, they planned a very small, intimate wedding with just a handful of friends present. They were married by a judge on a small tucked away corner of Cattleman's Ranch in Fabens, Texas. For the traditional wedding toast they brought champagne that was made right in their hometown in Germany. Their wedding was featured on IntimateWeddings.com, click on over to read more about it and see more photos, like Sabrina's cacti bouquet! Jennett and Armando also dealt with a little bit of weather during their summer wedding. Not the freak storm kind, but just enough to make a moody dark sky. Which I don't mind at all! Jennett's hair and make up was done by Brenda Tarango. Gorgeous bouquets were created by Barb's Flowerland. Details and coordinating by Elegant Events. I am so pleased that a few images from the Los Portales styled shoot were featured in the magazine. This was such a fun shoot to collaborate on with a ton of the area's most creative wedding vendors! You can read all about the details, there are a ton, on this blog post. Or see the wedding blogs this shoot has been featured on: The Glittery Bride and The Coordinated Bride. You can find a copy of the Las Cruces Bulletin's 2018 Perfect Southwest Weddings around stores in Las Cruces. 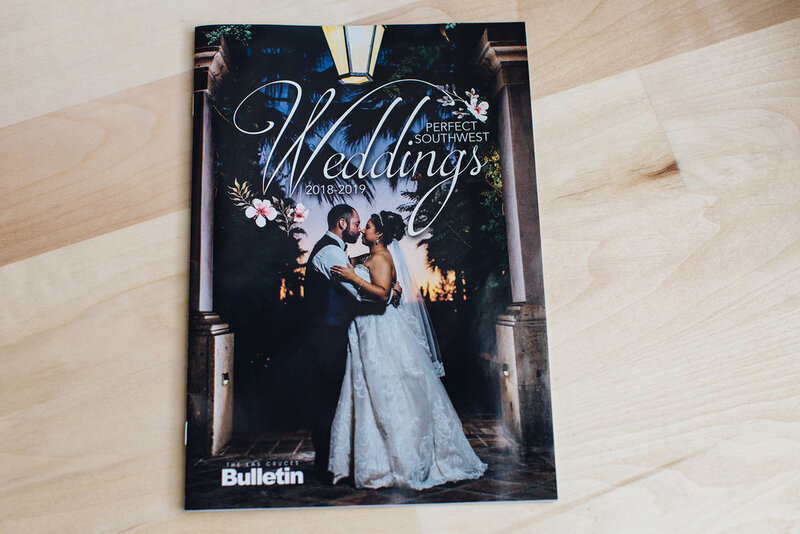 Thanks to all the wonderful wedding vendors who make these special moments even more special and of course thank you to the editorial staff at the Bulletin for featuring our wedding photography!